According to a Chinese statement, the U.S. and India should play no role in resolving South China Sea disputes. On Wednesday, China condemned the recent United States-India joint statement which called for countries to respect the freedom of navigation in the South China Sea according to the United Nations Convention on the Law of the Sea (UNCLOS). Chinese foreign ministry spokesman Hong Lei told a media brief that China’s “position is that the dispute in the South China Sea should be resolved by countries directly concerned through negotiations and consultations. Any third party should not be involved in this.” Hong made the remark in response to a question about the U.S.-India joint statement. The U.S.-India joint statement was released on September 30; the Chinese foreign ministry’s late reaction is due to the week-long National Day holiday that begins on October 1. Following Indian Prime Minister Narendra Modi’s trip to the United States, which ended last week, the two sides released a joint statement as is customary. 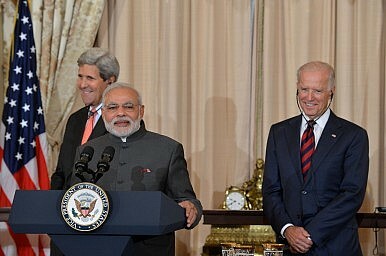 The statement made a series of declarations on U.S.-India cooperation in the areas of defense and security in the Asia-Pacific and elsewhere. The statement marked the first time that the United States and India jointly made a declaration on the South China Sea, specifically in calling for all countries in the region to respect a certain set of principles. Both the United States and India have a similar policy toward the South China Sea, and given increased tensions over the past year between China and South China Sea littoral states, the two leaders saw fit to emphasize their common stance. As both India and the United States remain outside the immediate South China Sea region, China sees their interference as unwarranted and illegitimate. Just 39 days after a first operation, the Trump administration authorizes a second FONOP in the South China Sea. Do US Actions in the South China Sea Violate International Law?India and Vietnam Advance Their Strategic PartnershipIndia and Vietnam Call for Freedom of Navigation in South China SeaUS Pacific Command Plans Responses for Unilateral Chinese CoercionIs US Pacific “Dominance” Up For Grabs?